Two weeks have passed since the Kindle Paperwhite arrived on my door. Two weeks have passed since I made reading a part of my daily routine. I find it remarkable how as a younger man reading was a task I had to complete for class, and now as the platinum highlights begin to appear near my temples, reading is a luxury I had deprived myself of. For me, adding reading to my evening routine allowed me to quiet my mind and immerse myself into another place before drifting to sleep. In the morning i would find myself more alert and more rested, and in the evenings i found myself able to fall asleep easier. Rather than turning on the TV to wind down, I flip page after page of books that i could download in an instant, all while keeping my bedside table clear and tidy. And now I have the good fortune to pass on this rediscovered past time to one lucky winner. First I would like to take a minute to thanks all of you that entered. We received entries on Facebook, Twitter, and Instagram from all over Canada. 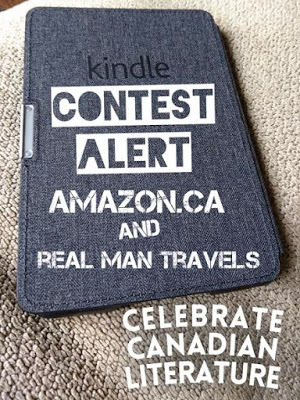 Second I would like to thank Amazon.ca for partnering with us to celebrate Dad's everywhere and Canada's 150th Birthday. Now, without any further delay, our winner of the $150 Amazon.ca Gift Card comes by way of Facebook, from Winnipeg,Manitoba - Toby Collins, Congratulations!